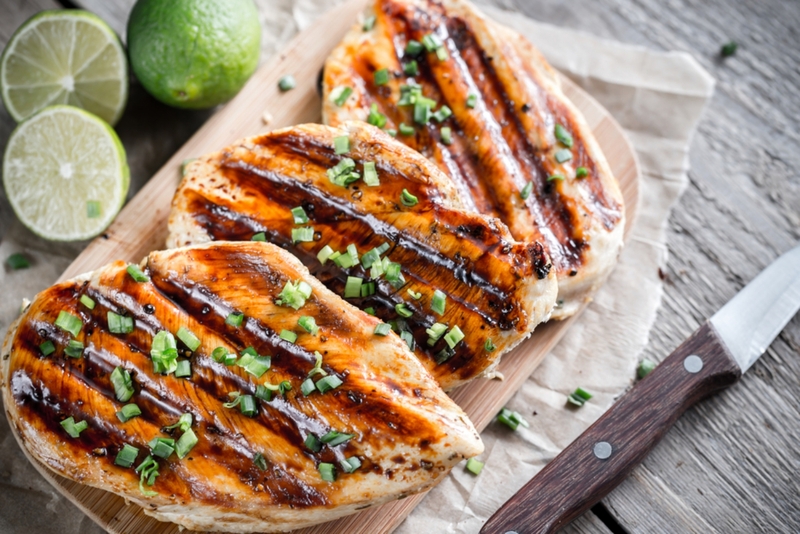 We LOVE This Super Simple, Sweet Sriracha Grilled Chicken! This delicious grilled chicken is an often requested weekday dinner in our household, and a favorite among friends at weekend barbeques. Whenever we find ourselves craving that sweet-tangy-salty-spicy flavor combination, this super easy marinade totally hits the spot. The Sriracha adds just the right amount of punch to the palate, the honey lends that mouth-watering sweetness and the lime imparts yummy, balancing tang – and there’s no need to add any salt, because the soy sauce takes care of that factor all on its own! So simple to throw together, you might even find you already have the ingredients on hand and can skip a trip to the store! Try it on pork or beef as well! To make the marinade, whisk together honey, soy sauce, lime juice, olive oil, crushed garlic and Sriracha in a medium bowl. Put chicken breasts and marinade mixture into a large ziplock bag. Seal and mash around with your hands making sure each breast is coated. Refrigerate for at least 1 hour, or overnight. When ready, preheat the grill to medium heat (about 375º F). Using tongs, carefully remove each chicken breast from marinade bag and place on the preheated grill. Discard the bag along with any excess marinade still inside. Grill chicken breasts for 4 to 6 minutes on each side. When done, transfer to a serving platter and enjoy!